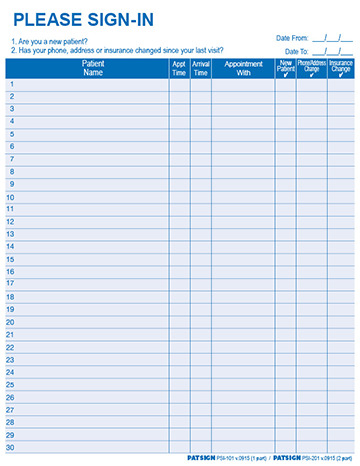 One Part HIPAA Patient Sign-in Label Sheets. Our new one part HIPAA Medical Office Sign in Sheets with peel off labels are saving medical offices a lot of money. There is no "carbon copy" (record copy). If you don't need that second part, this is the form to order. 30 labels per sheet. 125 sheets per pack. These ship via UPS ground with a 4-5 day delivery. For traditional two part forms, click here. Understand the difference between our two part forms and one part forms. Questions? Call Alan @ 602.482.1142 direct.